Mid Argyll & Kintyre covers a large swathe of mainland Argyll & Bute. It extends from Southend near Campbeltown in the south to, almost, Dalmally in the north, a distance by road of 100 miles. The description below starts in the south and progresses north and then east. For accommodation in Mid Argyll & Kintyre see the links in the "See and Stay" menu above. See the map below for an outline of the area and links to surrounding areas. Set at the head of a deep loch, sheltered by Davaar Island and surrounding hills, is Campbeltown, one of the largest towns in Argyll. Its heyday was in the Victorian era with its thriving shipbuilding, fishing and whisky industries. Today only three distilleries are in production. 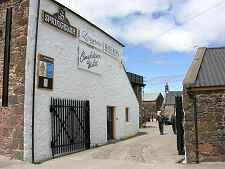 The best known is Springbank Distillery, which provides a unique insight into a distillery which undertakes 100% of the process in-house. 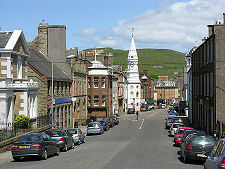 Elsewhere in Campbeltown is the excellent Campbeltown Heritage Centre, while on the quayside is the Campbeltown Museum and Library and the nearby "Wee Picture House". Campbeltown also has some striking churches, including the Lorne and Lowland Church and its huge tower, built for the Scots-speaking residents of the town, and the Highland Parish Church, built for the Gaelic-speaking highland population. Ten miles south of Campbeltown lies Southend and the very attractive Dunaverty Bay. Nearby is the spot where in AD563 St Columba first landed in Scotland after being exiled from Ireland, a journey that took him onwards to Iona. St Columba's Footprints carved in the rock at Keil Head are said to mark his visit, and the nearby St Columba's Chapel also commemorates him. Carskey Bay and Macharioch Bay both have appealing beaches overlooking Ailsa Craig in the Firth of Clyde. Beyond Keil, the road continues to the most southwesterly point of the peninsula, the Mull of Kintyre. From here, Ireland, only 12 miles away, is clearly visible. 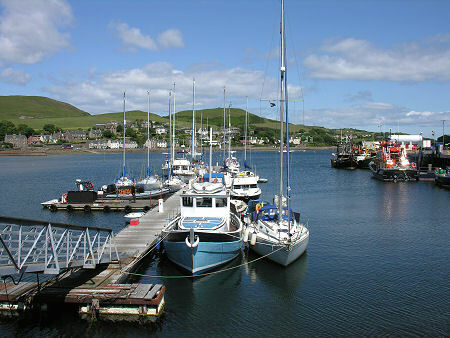 Campbeltown lies at the eastern end of the only low lying part of Kintyre; the western end being occupied by Machrihanish, five miles from Campbeltown. Its airport boasts one of the longest runways in Europe, and provides air services to Glasgow. Meanwhile, Machrihanish is increasingly making a name as an internationally important golfing destination. The east coast of Kintyre offers a narrower and twistier road, which becomes single track north of the attractive fishing village of Carradale. This is the location of the Carradale Network Centre, a heritage centre. This isn't the side for anyone in a hurry, but it does offer dramatic views of Arran, and a range of surprising little settlements, including Saddell, home to the ruins of Saddell Abbey. Nearer Campbeltown the road also passes the well preserved remains of Kildonan Dun. Further north is the slipway at Claonaig, from where you can catch the ferry to Lochranza on the Isle of Arran. 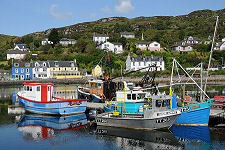 Tarbert is a lovely fishing village backed by rocky hills. The distinctive church tower dominates its skyline. 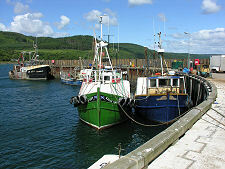 Tarbert was a centre for the herring industry as far back as 836 when it gained mention in the Annals of Ulster. As you travel south from Tarbert, you realise just how close the rest of Kintyre is to being an island, with only the short distance from East Loch Tarbert to West Loch Tarbert providing the link back to the mainland. A few miles further still is Kennacraig, the location of the main ferry terminus for Islay; and a rather lonely spot in which to find such an important transport link. Lochgilphead is the administrative centre of Argyll and Bute. It lies at the head of Loch Gilp, an arm of Loch Fyne. It is also the chief town of mid-Argyll, an area which extends west from Loch Fyne to the Atlantic Ocean. Lochgilphead is a planned town in the style of Inveraray and Bowmore on Islay. There are tourist services in the town and a range of places to stay. South of Lochgilphead is the small port of Ardrishaig. This is the south-eastern end of the Crinan Canal, a waterway built in 1801 to allow vessels to avoid the long trip around the Mull of Kintyre. The western end of the canal is at Crinan on the Sound of Jura, providing direct access to the North Atlantic and the Hebrides. Close by is the peninsula leading to the harbour village of Tayvallich. A minor road down the other side of Loch Sween leads to Inverlussa Church, Castle Sween, a nearby Cross Slab, and Kilmory Knap Chapel. 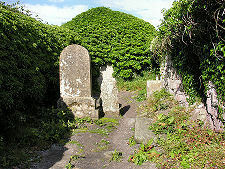 North of Lochgilphead is the most important collection of historic sites on mainland Scotland. Kilmartin Glen, has over 800 ancient monuments, some dating back as far as 5,000 years. Of particular note is the ancient fortress of the Scots at Dunadd. The village of Kilmartin sits at the heart of this amazing landscape. 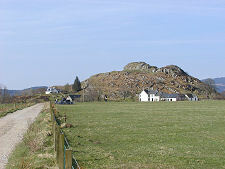 Within this area we have individual features about Kilmartin Museum, Kilmartin Church, Kilmartin Scuptured Stones, Temple Wood, Nether Largie Standing Stones, Nether Largie South Cairn, Dunchraigaig Cairn, and Ri Cruin Cairn. 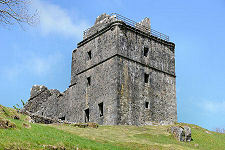 A mile to the north of Kilmartin is the imposing ruin of Carnasserie Castle. Head north east along the A83 from Lochgilphead and you come to the attractive whitewashed town of Inveraray, on the shores of Loch Fyne, built by the 3rd Duke of Argyll in the latter half of the 1700s. Its harbour is home to the Arctic Penguin, a three masted schooner built in 1911, and now part of the town's Maritime Heritage Centre. Another attraction in the town is Inveraray Jail. This is a jail and courthouse which allows visitors an insight into the world of Victorian crime and punishment. On the edge of Inveraray is the town's best known attraction, Inveraray Castle, the magnificent seat of the Dukes of Argyll. Driving Tours: Part of the area is included in our Oban & Inveraray Driving Tour.